What is a Continuous-flow system ? 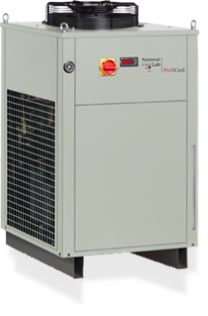 National Lab recirculating chillers may also be specified as continuous flow systems. They are also supplied as compact, ready-to-install units for cooling liquids within a circuit. As is the case with recirculating chillers, they use water or water with additives as the liquid (cooling medium). Continuous flow systems have a similar construction and function to recirculating chillers, but are designed without their own tank for connection to external liquid volumes (e.g. an external tank). If customers have already provided their own cooling medium supply, the continuous flow system can of course be supplied without a pump. Designed without their own tank for connection to external liquid volumes. If already provided, the continuous flow system can be supplied without a pump.